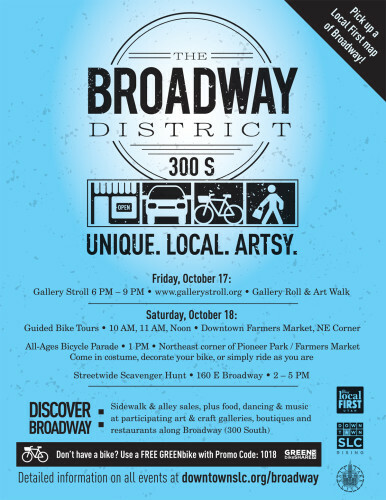 October 15, 2014 – The grand opening of the new protected bike lane on 300 S will be held in conjunction with The Discover Broadway Festival this weekend on 300 South (Broadway) in Salt Lake City, Utah this Saturday, October 18, 2014 from 10 am to 5 pm. The 300 South protected bike lane runs from 300 West to 600 East. The bikeway places riders close to the curb with a barrier and car parking between the rider and traffic, and provide the cyclist with a greater margin of safety than standard bike lanes or sharrow treatments. Observational evidence indicates that cyclists are already heavily using the new bike lane. This the second protected bike lane in Salt Lake City, and will be part of a much larger network throughout the downtown area. The next protected bike lane will be installed on 200 West from North Temple to 900 South in Spring of 2015. The first protected bike lane is on 300 East and around 700 S. This was a pilot project that has lead to plans for a network. The festival will feature guided bike tours at 10, 11, 12 leaving from the Farmer’s Market NE corner (300 S and 300 W). 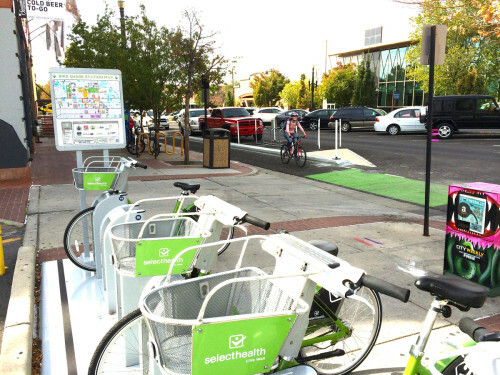 If you don’t have a bike, Greenbike bike share will be free on Saturday with the promotional code of 1018 (http://greenbikeslc.com) . The event will feature sidewalk sales, food, music, art, and dancing. Additionally, there will be a bicycle scavenger hunt (https://www.facebook.com/events/1474497862830465/). The festivities will also be on Friday night with Gallery Roll and Stroll (http://gallerystroll.org) from 6-9 pm. You can ride or walk to the many art galleries on 300 S, and nearby in downtown Salt Lake City.